DW Life > d i v e r s i t y w o m a n . c o m Fa l l 2 0 1 7 D I V E R S I T Y W O M A N 67 THINKSTOCKPHOTOS New Balance Minimus 40 is minimalist, flexible shoe has a mesh upper and bounce technology. A durable Vibram sole with good traction makes it a good all-around shoe for outdoor sports as well as stability in the gym. Reebok CrossFit Nano 7.0 Breathable but durable, the Nano has forefoot traction and flexibility and a shock-absorptive and extracushioned midsole. A heel lock makes it a preferred shoe for weight training and CrossFit. Ryka Influence e Influence is a light, flexible, cush- ioned shoe popular for Zumba because it has pivot points plus traction toward the edges, characteristics that Mandell says are needed for Zumba or dance-type classes. Hiking Shoes & Boots C hag recommends a little extra room at the toe of a hiking boot. "As you descend a trail, your foot slides forward in the shoe, and if your toes are constantly bumping up against the front of the shoe, you can kiss your toenails good-bye," she says. 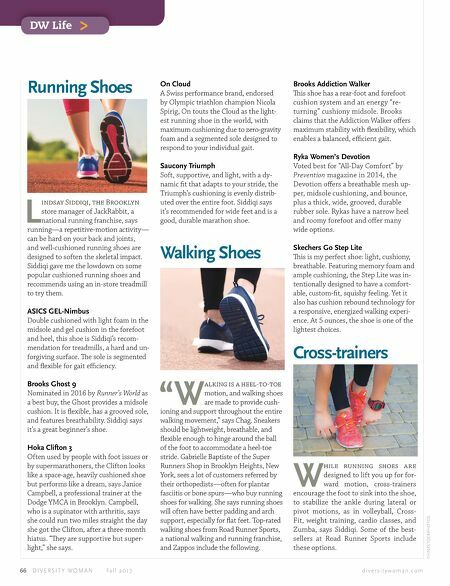 Your heel should feel locked in, minimizing up and down motion, and the shoes should feel good immediately, with minimal break- ing in needed, says the American Hiking Society (AHS). 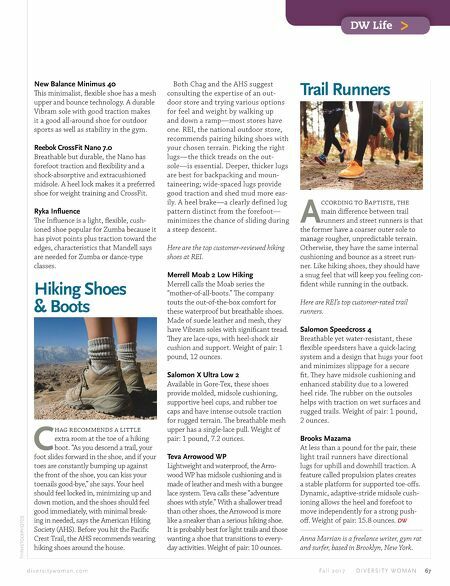 Before you hit the Pacific Crest Trail, the AHS recommends wearing hiking shoes around the house. Both Chag and the AHS suggest consulting the expertise of an out- door store and trying various options for feel and weight by walking up and down a ramp—most stores have one. REI, the national outdoor store, recommends pairing hiking shoes with your chosen terrain. Picking the right lugs—the thick treads on the out- sole—is essential. Deeper, thicker lugs are best for backpacking and moun- taineering; wide-spaced lugs provide good traction and shed mud more eas- ily. A heel brake—a clearly defined lug pattern distinct from the forefoot— minimizes the chance of sliding during a steep descent. Here are the top customer-reviewed hiking shoes at REI. Merrell Moab 2 Low Hiking Merrell calls the Moab series the "mother-of-all-boots." e company touts the out-of-the-box comfort for these waterproof but breathable shoes. Made of suede leather and mesh, they have Vibram soles with significant tread. ey are lace-ups, with heel-shock air cushion and support. Weight of pair: 1 pound, 12 ounces. Salomon X Ultra Low 2 Available in Gore-Tex, these shoes provide molded, midsole cushioning, supportive heel cups, and rubber toe caps and have intense outsole traction for rugged terrain. e breathable mesh upper has a single-lace pull. Weight of pair: 1 pound, 7.2 ounces. Teva Arrowood WP Lightweight and waterproof, the Arro- wood WP has midsole cushioning and is made of leather and mesh with a bungee lace system. Teva calls these "adventure shoes with style." With a shallower tread than other shoes, the Arrowood is more like a sneaker than a serious hiking shoe. It is probably best for light trails and those wanting a shoe that transitions to every- day activities. Weight of pair: 10 ounces. Trail Runners A ccording to Baptiste, the main difference between trail runners and street runners is that the former have a coarser outer sole to manage rougher, unpredictable terrain. Otherwise, they have the same internal cushioning and bounce as a street run- ner. Like hiking shoes, they should have a snug feel that will keep you feeling con- fident while running in the outback. Here are REI's top customer-rated trail runners. Salomon Speedcross 4 Breathable yet water-resistant, these flexible speedsters have a quick-lacing system and a design that hugs your foot and minimizes slippage for a secure fit. ey have midsole cushioning and enhanced stability due to a lowered heel ride. e rubber on the outsoles helps with traction on wet surfaces and rugged trails. Weight of pair: 1 pound, 2 ounces. Brooks Mazama At less than a pound for the pair, these light trail runners have directional lugs for uphill and downhill traction. A feature called propulsion plates creates a stable platform for supported toe-offs. Dynamic, adaptive-stride midsole cush- ioning allows the heel and forefoot to move independently for a strong push- off. Weight of pair: 15.8 ounces. DW Anna Marrian is a freelance writer, gym rat and surfer, based in Brooklyn, New York.